Click image to enlarge Fort Columbia State Park, Washington. Image taken April 19, 2005. 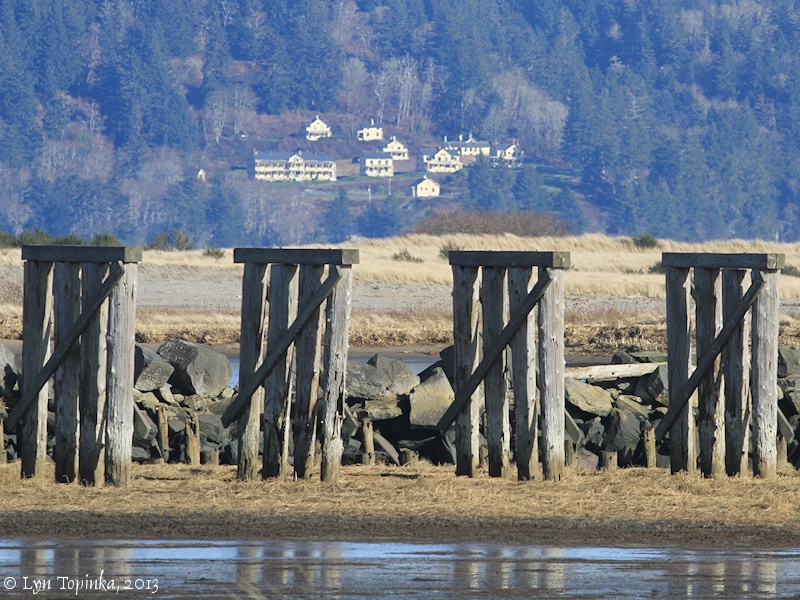 Fort Columbia is located on Scarboro Hill above Chinook Point, just upstream of Baker Bay and two miles downstream of Point Ellice and the Astoria-Megler Bridge. The historic town of Chinook lies downstream and Station Camp, where Lewis and Clark spent 10 days in November 1805, lies upstream. 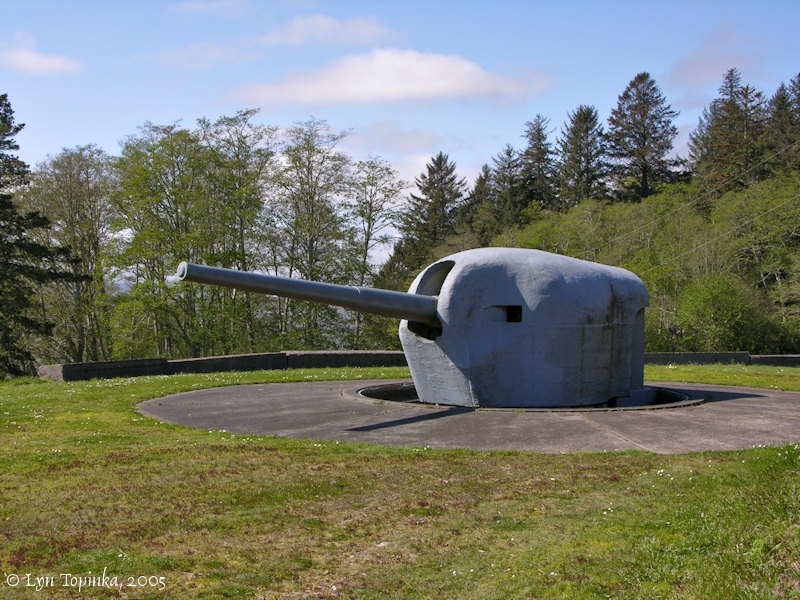 Fort Columbia was one of three forts built to defend the mouth of the Columbia River, the other two being Fort Canby on Cape Disappointment, and Fort Stevens on Point Adams. 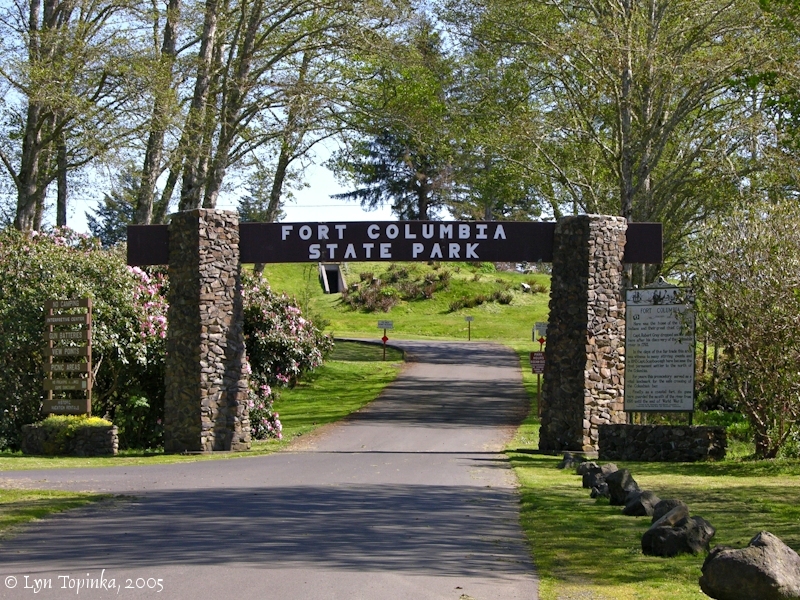 Fort Columbia has an unobstructed view of the Columbia River and Baker Bay from Cape Disappointment downstream to Astoria, Oregon upstream. 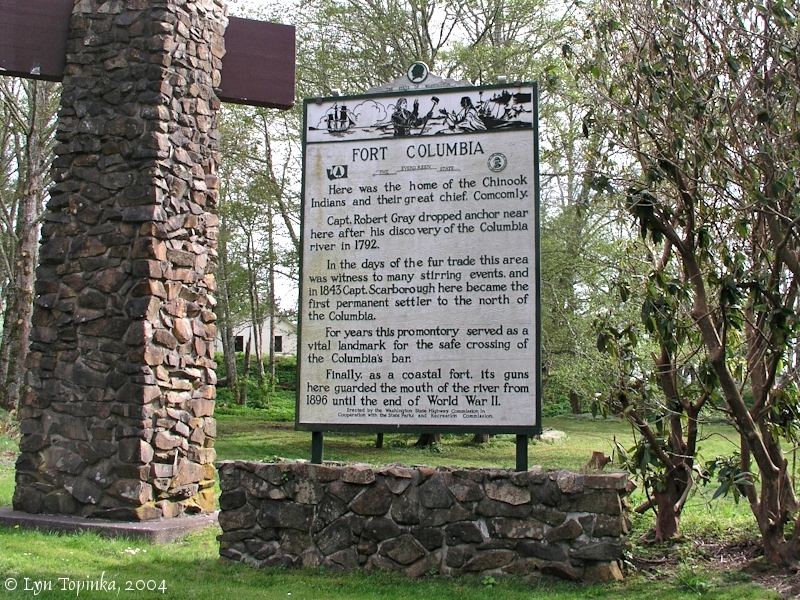 In 1950 Fort Columbia became a Washington State Park, and in 2004 the State Park became part of the Lewis and Clark National and State Historical Parks, a grouping of sites important in the Lewis and Clark story. 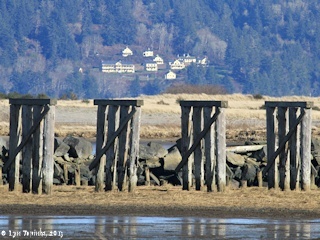 Click image to enlarge Fort Columbia, Washington, as seen from Trestle Bay, Oregon. Image taken February 2, 2013. Scarboro Hill is the hill which rises above Chinook Point and is the home to Fort Columbia. Scarboro Hill (sometimes seen as "Scarborough Hill") was named after James A. Scarborough who settled at Chinook Point in 1843, filed a Donation Land Claim, and lived on the property until his death in 1855. James Scarborough's property extended about a mile along the north bank of the Columbia, and included all of Chinook Point and most of Scarborough Hill. "... Ann Scarborough died in 1852 and Captain Scarborough died two and a half years later, on February 4, 1855. On April 23, 1856, James Birnie, guardian of Scarborough’s two young sons, sold the Scarborough Donation Land Claim to Rocque Ducheney for $1,250. On March 7, 1864, Captain George Henry Elliot bought the property on behalf of the United States from Ducheney’s heirs for $2,000. An additional $1,000 was paid to Ducheney’s widow and her new husband for a quit-claim deed renouncing all interest in the property. The Secretary of War approved the transaction and the deed was recorded on March 13, 1867. 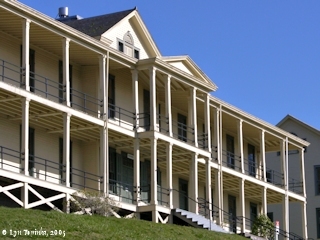 In 1898, the property became the U.S. Army's Fort Columbia. At the end of World War II, Fort Columbia was declared surplus and in 1950 was transferred to the custody of the state of Washington. Since then it has been a state park. Twelve historic wood-frame buildings still stand on the premises. 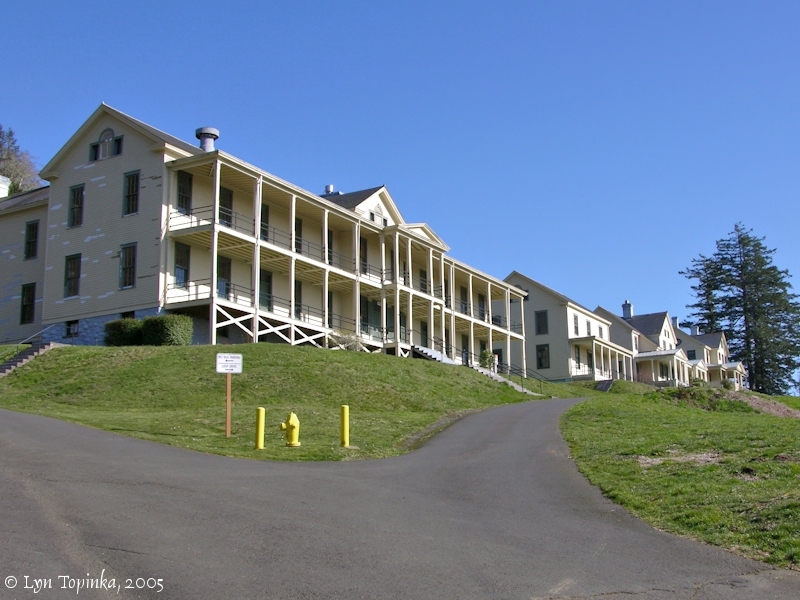 ..."
Chinook Point was added to the National Register of Historic Places in 1966 (Site #66000747) for its discovery by Captain Robert Gray, laying the foundation for claim of the Pacific Northwest by the United States, and its subsequent stratigic military location of Fort Columbia. 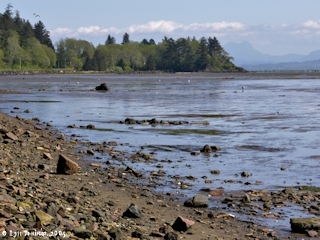 Click image to enlarge Chinook Point, Washington. As seen from Chinook County Park, downstream of Chinook Point. Saddle Mountain is along the horizon, right. Image taken April 19, 2005. 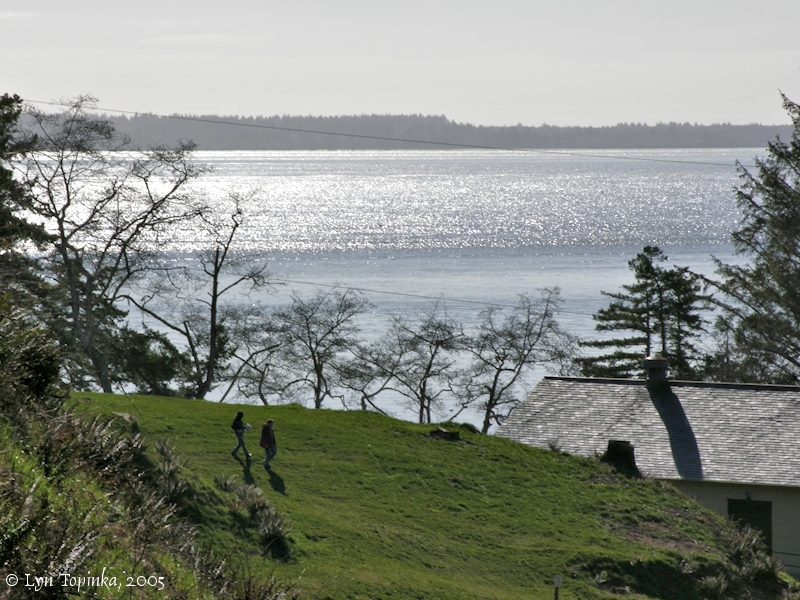 Chinook Point and Scarboro Hill, the location of today's Fort Columbia, was once a Chinook Village headed by Chief Comcomly, who was not only a friend of Lewis and Clark, but also a benefactor of the early Astorians. Fort Columbia was built from 1896 to 1904, one of three forts designed for harbor defense of the Columbia River (the other two being Fort Canby and Fort Stevens). 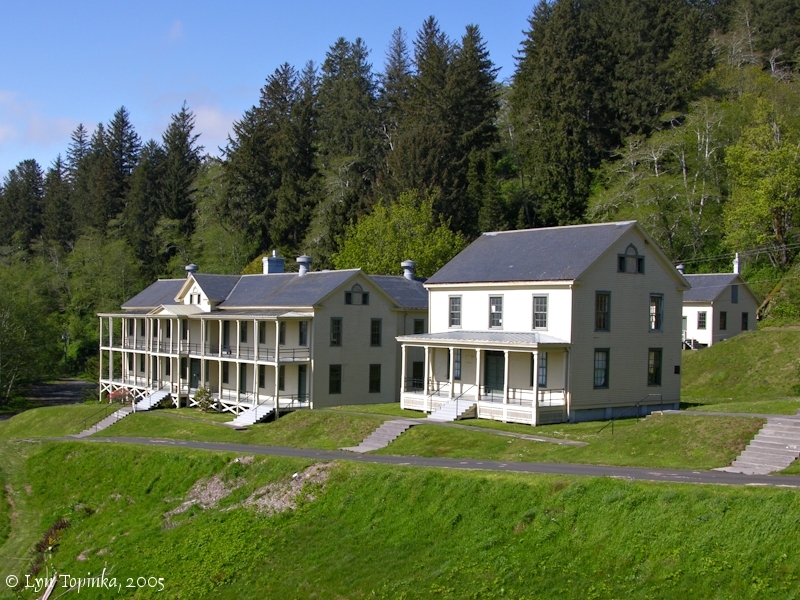 Fort Columbia remained fully manned and operational through three wars, until declared surplus in 1947 at the end of World War II, when it was transferred to the custody of the State of Washington in 1950 and became Fort Columbia State Park. 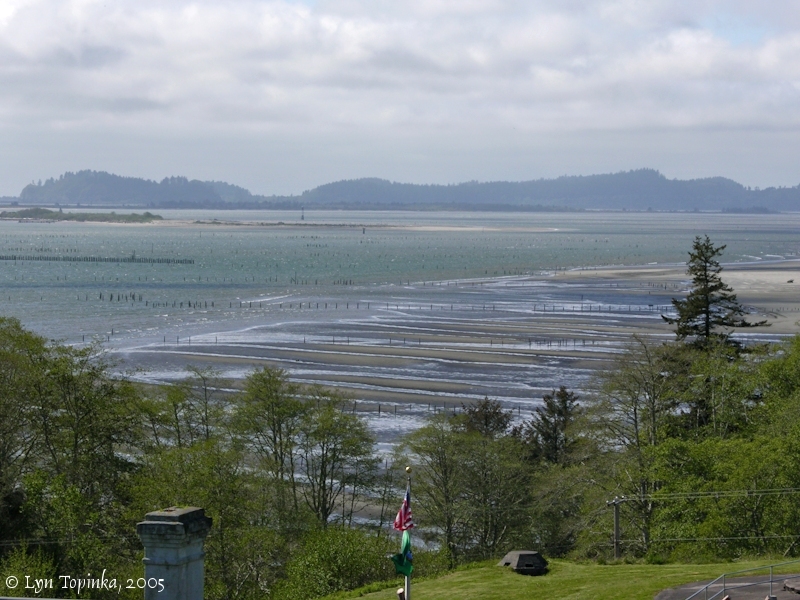 In 2004 the State Park became part of the Lewis and Clark National and State Historical Parks, a grouping of sites important in the Lewis and Clark story. Twelve historic wood-frame buildings remain. 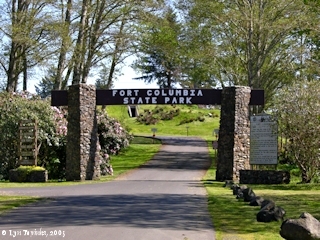 "... FORT COLUMBIA: A deactivated military fort, now known as Fort Columbia Historical State Park, on Chinook Point overlooking the Columbia River. The Chinook Indians called the point "No's-to-ils" and the hill (now called Scarborough Hill) behind the point "No'si-misp". The point and hill were a permanent Indian encampment for decades unknown before the arrival of white settlers. Chief Concomly, a famed Chinook leader (ca. 1810 to 1830), maintained his principal lodge on the hill. Captain James Allan Scarborough, retired Hudson Bay Company employee, and his Indian wife Ann Elizabeth, settled on the hill around 1846 and filed a Donation Land Claim under the Law of 1850. After his death in 1855, title to the property was transferred to Rocque Ducheney, HBC employee living in nearby Chenookville. 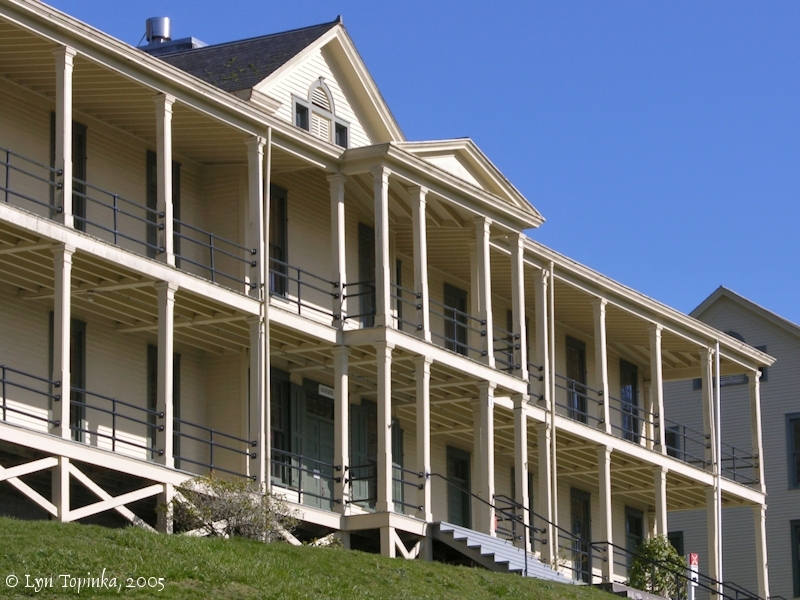 In 1867, the Federal government purchased Chinook Point for a military reservation from the Ducheney heirs for $2,000. It wasn't until 1895 that the War Department decided to build a fort and install gun batteries. The fort was first occupied by a regular garrison in June 1904. A post office was established June 30, 1890, and continued in operation until January 31, 1923. Fort Columbia was deactivated March 28, 1947, and listed as surplus. 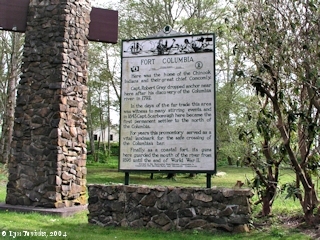 The old military post became Fort Columbia Historical State Park at a dedication ceremony held June 17, 1951. 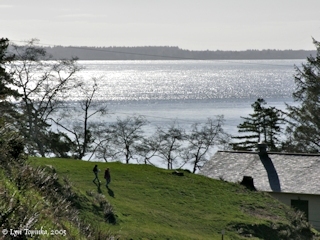 ..."
Fort Columbia State Park is a 593-acre day-use historical park located on Scarborough Hill at Chinook Point. 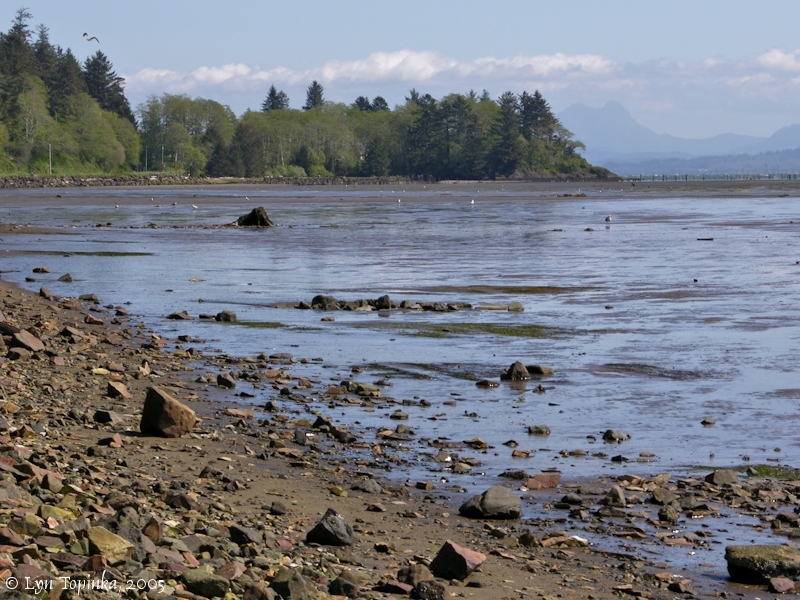 The Park has 6,400 feet of freshwater shoreline on the Columbia River. The fort was fully manned and operational through three wars, and was part of the harbor defense of the Columbia River from 1896 to 1947. Click image to enlarge Barracks, Fort Columbia State Park, Washington. Image taken February 19, 2005. Click image to enlarge Fort Columbia State Park, Washington. Image taken February 19, 2005. Battery 246, located at Fort Columbia, was one of three Batteries surrounding the mouth of the Columbia River. 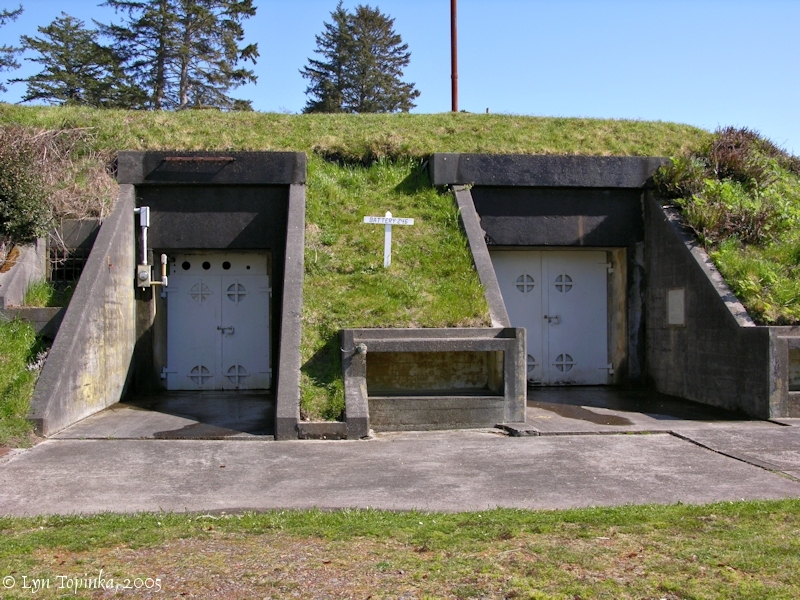 Battery 245 was located at Fort Stevens, Oregon, and Battery 247 was located at Fort Canby, located at Cape Disappointment. 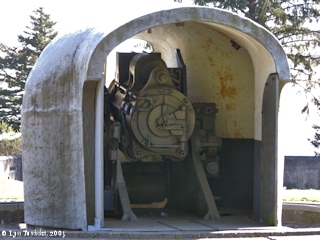 Click image to enlarge Battery 246, Fort Columbia State Park, Washington. Battery 246 was a World War II installation, completed in 1945. Image taken April 19, 2005. Click image to enlarge 6-Inch Canon, Battery 246, Fort Columbia State Park, Washington. Fort Columbia has two 6-inch canons. Only four others exist in the world. Image taken April 19, 2005. Click image to enlarge 6-Inch Canon, Battery 246, Fort Columbia State Park, Washington. Image taken April 19, 2005. Click image to enlarge Columbia River from Fort Columbia Barracks, and Chinook Point. Image taken February 19, 2005. 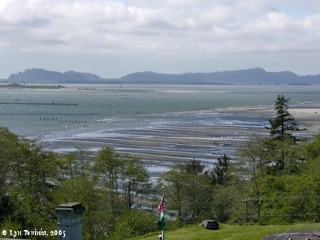 Click image to enlarge Baker Bay as seen from Fort Columbia. The tide is out. Cape Disappointment is in the far distance. Image taken April 19, 2005. Click image to enlarge Penny Postcard: Fort Columbia, Washington, ca.1910. Penny Postcard, ca.1910, "Quarters, Fort Columbia, Wash.". Divided back. In the private collection of Lyn Topinka.